This past weekend I officially earned a new geek badge as I started my first Dungeons and Dragons campaign. I will have a full recap in the near future as well as some other game related posts, but it felt good to finally embark on a magical journey with my friends. It was light hearted and fun, and I look forward to seeing where our adventures take us on our next attempt. While I still have a long way to go until I earn all of my badges, I felt that after nearly 40 years I was overdue for rolling a D20 (with very mixed results). Saga #38 - Curse you Brian K. Vaughan. You lulled me to sleep with a whimsical tale of 6 months of peace for Marko, Alana, Hazel, and crew. A pit stop on a planet led to a nice alliance with some sweet and cuddly aliens who quickly became friends of Hazel and therefor her parents. It was easy to forget that this series is set in a galactic war and that everyone of their crew has real enemies and individual agendas. The beauty of their spaceship, which is a magical tree, providing much needed food for victims of the war was vanquished in an unexpected way that still has me trembling. When the only condolences our creators can offer in the letter pages is a cute dog photo you know some serious stuff just went down. If you will excuse me, I have something in my eye. 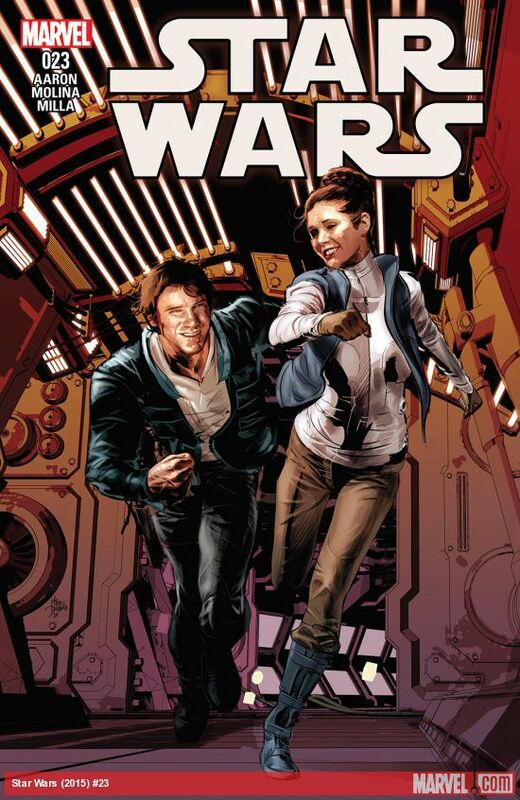 Star Wars #23 - If it weren't for another stunning issue of Saga, this would have easily been pick of the week. It was the last issue that featured a daring heist of an Imperial Star Destroyer, and this issue featured the next chapter for the Rebels. The crew featuring Luke, Leia, Han, and others attempt to repair the Star Destroyer to the best of their ability so that they can use it to get past a blockade and deliver much needed supplies to an ally planet. Thing about stealing something as big as a Star Destroyer, people tend to notice you. Another problem with stealing such a large ship that is in need of repair, there are many holes in its defense. Things are not as rosy as they seem and the upcoming threat that this crew will have to deal with has me shaking with excitement. This series has captured the excitement that this series had when it first launched and will hold over even the grumpiest fan until Rogue One. Tales from the Darkside #4 - This mysterious title from Joe Hill and Gabriel Rodriguez, of Locke and Key fame, has really come into its own in this issue. I was on the fence with the title, but fully grasp what the Darkside truly is and what the threat is that people are up against. There is something terrifying about evil children that Hill understands. It was effective in Locke and Key, and it was effective as a babysitter in this issue had her hands filled with a pair of tablet wielding kids. The use of tablets made for a nice modernization of a window to another universe.